I recently purchased this ficus from a local nursery. I have done some minor pruning, bending, and wiring. I am now considering whether or not to separate it into 2 to 9 bonsai. When would be a good time to separate, if that is what I end up doing? Spring, summer, let it grow for a year? edit: Mods: I should have posted this in "indoor bonsai"
It is quite unlikely that that pot is a single raft-planting. I expect they were planted as a group and are individual saplings. Inasmuch as these are indoor trees, as long as you do not use peat or loess based potting soils they should be fine. The learning forum should have good recipes on how to mix bonsai soil. Yeah, they look like individual trees. So it isn't really a question of dividing them, they are already separate. So let's call it repotting to give them their own pots. Tom do you want to speak to the question of when that should be done. We often say re-potting should be done in the spring, but I think that is particularly for deciduous trees. Ficus is a tropical evergreen, which will grow year around. It does grow less when the days are short and it is getting less light. Do you still think this re-potting should wait until spring? They are going to be competing with each other, all those trees in one pot and the roots will get more and more tangled together. 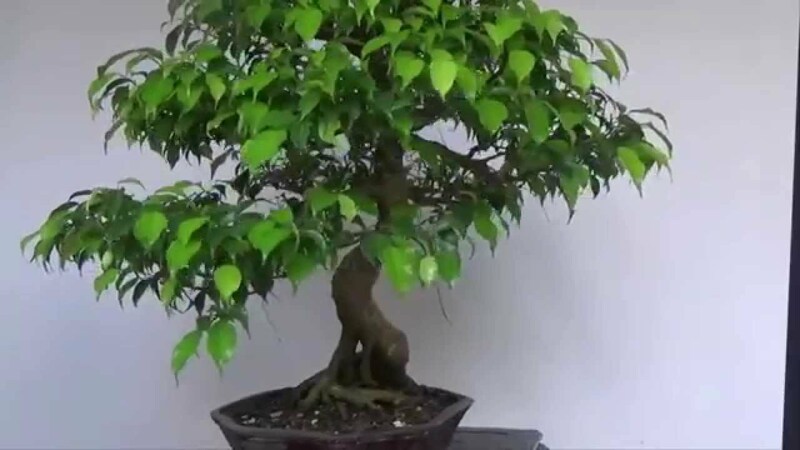 I would lean towards going ahead and doing it right away, but let's hear what tom says; he knows a lot more about bonsai and generally trees in pots, than I do. No I wouldn't wait for spring. If I have a concern; 1., It is the reduced light of winter. 2., Soil mix with very tiny particle size, which holds too much water, and too little air. 3., Placement too near to central heating. My tender trees get as much light as I can cobble for them (and I believe it to be too little). And my HVAC does not adequately humidify air for trees. Our OP may be in my shoes in this regard too. Low light levels, makes for bigger leaves with longer internode lengths. Both of which are kind of a fork to the eye of bonsai training, Rig up just as much light as you can. You can always reduce light levels later if you need to. Figs back bud well enough. As always be a little conservative as you prune, and leave on a terminal leaf on each branch. If you can't find bonsai soil, cactus mix is better than regular potting soil. Your trees will benefit from daily misting, while they are indoors in dry air. And I wouldn't worry too much about wiring at this point. Like I said these are not bonsai, these are saplings just starting bonsai training. They are going to go through a lot of steps before they get to a finished style. Well, I took your advice and did the separation. I'm glad that is over with. Now they can rest and recoup for the next year. A few had common roots, so I left them in the same pot. However, I didn't use bonsai soil, as I was advised to. I have had success with my ficus house plants using a 1-to-1 mix of perlite and potting soil. So I went with what I am comfortable with. I will use bonsai soil when it is time to move them into bonsai pots. Your mix should be fine for now. Mixing your potting soil with equal parts of perlite makes it much more free draining than just potting soil would be. Your trees are looking good! The smallest tree died. But it didn't have many roots. Bummer, it was one of my favorites. The rest went through a short period of dropping leaves, but they have since turned around and have a lot of backbudding going on. I just transferred the largest to a new pot and did some pruning and wiring. Soon I will re-pot the rest and in the spring sell all but one or two. I kept the three that seemed to have the most potential of someday becoming a bonsai. The other two I gave away to neighbors as Christmas gifts. Now it is a matter of training up the branches, filling out the leaves, and increasing the trunk thickness. That should only take a couple years.. I trimmed the primary tree way back. This is the direction I see this one going.. The smallest ficus is now a ROR project. Looking good! You clearly know what you are doing and have some idea of where you are headed with each tree. I went ahead and air-layered the biggest of the trees. I had to do something with that tall trunk. The bottom I was going to just throw away, but it sprouted some shoots so I am going to grow it out and see what happens.. The bottom one doesn't look like much right now, but it may be the one with the most potential to some day be a bonsai of distinction! You are doing good work!